Bangkok, Thailand – In the ring, professional Muay Thai fighters pummel each other with fists, elbows, knees, and legs as raucous crowds cheer them on. But UN Women believes that Thai-style boxers can also be role models for ending violence against women and girls. UN Women works closely with the International Federation of Muay Thai Amateur (IFMA) in efforts to change social behaviors and norms that fuel violence against women. UN Women sees Muay Thai as not just a sport, but also a platform to educate men and boys about positive masculinity. 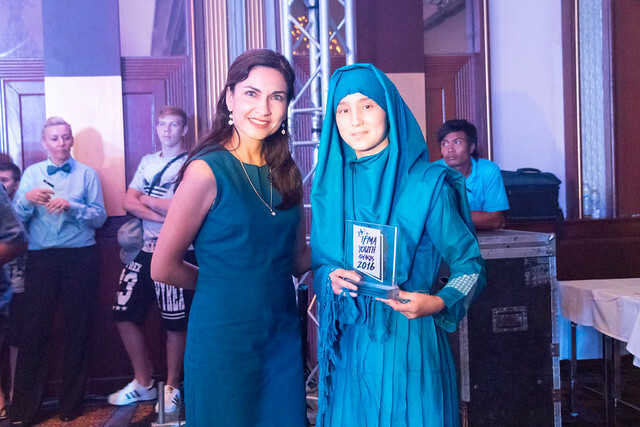 Thus, UN Women representatives took part in the 30-31 August “IFMA Conference on Youth, Education and the Future” and the Youth Awards Gala Night that followed the 12th IFMA Youth World Championship in Bangkok. About 1,000 athletes from 8-18 years old and from 45 countries attended. At the conference, Ornwipa Rugkhla, UN Women’s Regional Campaign Coordinator for Ending Violence against Women, shared with the young athletes that they can make a difference by joining the United Nations’ UNiTE to End Violence against Women and the Change-Makers peer-training campaigns. One in three women report having suffered violence against them, Ms. Rugkhla said, citing a study published in 2013 by the United Nations World Health Organization and other institutions. She said this violence is often perpetrated by a partner or a former partner and takes several forms: killing, trafficking, forced marriage, domestic violence, and sexual violence are a few. The violence arises from discrimination, harmful notions of masculinity, and beliefs that women are of less value than men, she said. In addition, Ms. Rugkhla said, research has demonstrated that violence against children is deeply related to violence against women: Children who witness domestic violence up are more likely to be involved in an abusive relationship when they grow up than those who do not. Ms. Rugkhla shared with the audience the results of a United Nations multi-country study based on interviews with over 10,000 males between ages 18-49. One in four reported having committed violence against a woman at least once, and half of them did so before they were 20 years old, according to the study published in 2013. This, Ms. Rugkhla said, shows that communities must start reaching people when they are very young, raising their awareness and promoting positive social norms that value women and girls equally to men and boys. Ms. Rugkhla noted that coaches and athletes can serve as mentors and role models to boys and powerfully influence their lives. She gave examples of athletes in Georgia, Pakistan and Russia who have participated in successful awareness-raising campaigns on violence against women, she said. UN Women presented a special award for outstanding efforts towards gender equality to the Afghanistan Muay Thai Federation on behalf of IFMA. The Federation supported the participation of women and girls in the sport, in a country where they are denied the right to everyday activities such as driving and using certain public spaces. “Muay Thai helps me to achieve my dream,” said Afghan women boxer Zahra Rezaye in her acceptance speech.